In the Gold Rush year of 1849, J. Goldsborough Bruff, then 43 years old, captained the Washington City Mining Company to California. It took his party of 64 men and boys and 16 mule-drawn wagons some five months to make the arduous journey. He made the trip for the adventure of it and with the purpose of writing the definitive account of the great journey. 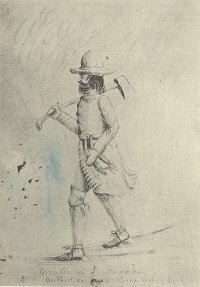 Bruff’s collected papers – his day-books, expanded notebooks, finished journal, maps, trail sketches, expanded drawings (based on those sketches), and, subsequently, his finished color paintings – without question constitute the most important body of historical documents pertaining to the great mid-Nineteenth Century overland emigrant migrations. They are a national treasure. The collection is divided between Beinecke Library at Yale University and The Huntington Library in San Marino, California.